The much-awaited trailer of Student of the Year 2 (SOTY 2) will be unveiled today (April 12). The upcoming rom-com is a sequel to the 2012 released film, Student of the Year. Starring Tiger Shroff, Ananya Panday and Tara Sutaria in the lead, this film is surely going to be a visual treat. Yesterday (April 11) when the makers revealed the character posters of the lead actors, fans are just waiting to catch a glimpse of the trio in the trailer. But looks like before that there’s something else in store and that is about Tiger’s role in the film. 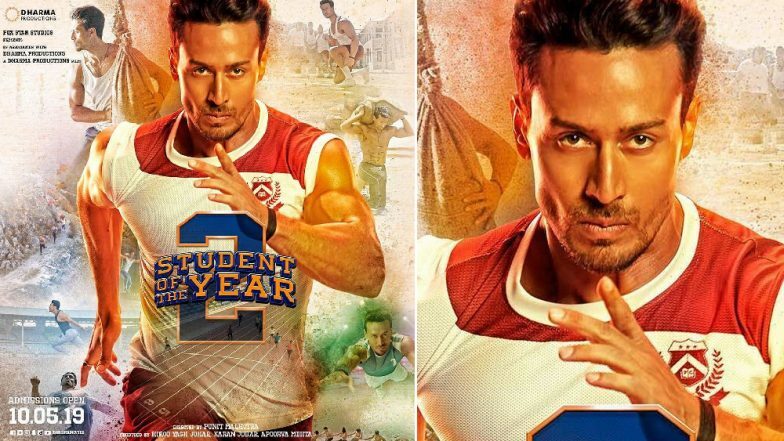 Student of the Year 2 New Poster: An Athletic Tiger Shroff Will Make You Root For Him - See Pic. The cinephiles are waiting to know the details related to SOTY 2. Fans are intrigued to know if the actors (Sidharth Malhotra, Alia Bhatt, Varun Dhawan) from the first film would do be a part of this sequel or not. Talking about the trailer a source revealed to Pinkvilla, “Karan (the director) has kept the trailer duration around 2:57 minutes wherein the new batch will be introduced. The look and feel of the movie are very much like SOTY but it is the plot this time which sets the movie apart from the first part.” The source also mentioned, “While there is no trace of Varun Dhawan or Alia Bhatt or any special number by the duo in the trailer, as against reports, a glimpse to the remake of "Yeh Jawaani Hai Deewani" song is sure to leave everyone excited.” SOTY 2 Stars Tiger Shroff, Ananya Panday and Tara Sutaria Should Truly Turn 'Students' to Will Smith's Brilliant Moves on Radha (Watch Video). The report also stated that the handsome hunk Tiger Shroff would be essaying the role of a blind man. However, there’s no confirmation about it and after seeing the posters, it is really difficult to believe that Tiger would be playing a visually impaired person in the film. All the doubts would be cleared once the trailer is out. Stay tuned for further updates!